Sewer backup insurance covers repairs to your plumbing as well as cleaning or replacement of damaged items. 1. Will Homeowners Insurance Cover Water Damage From Melting Snow? 3. Will Homeowner's Insurance Cover Sump Pump Failure? Just as you might insure your home against other forms of damage, taking out insurance against a sewer backup may be prudent. As sewer and waste disposal systems get older, the chances of the sewer backing up increase. This can result in sewage backing up in the bathtub or toilet. In extreme cases, the home can become flooded with sewage, ruining carpeting and furniture. Sewer backup insurance reimburses you for the cost of repairing or replacing the pipe, as well as the cost of cleaning or replacing damaged items. A typical homeowner's insurance policy will not cover sewer backup damage. Your insurance company may also refuse to cover problems with the sewer, which belongs to the city. However, you as the homeowner are responsible for maintaining the portion of pipe that runs between your home and the main sewer line. Exclusions to a standard property insurance policy will state that backed-up drains are caused by a lack of care and maintenance from the homeowner -- and are not covered. Your homeowner's insurance policy may include loss-of-use coverage, which may cover some of the costs related to damage in your home. If a sewer backup causes a flood within your home, it may damage the carpets, walls and even electrical systems, making it impossible to live in your home. Loss-of-use coverage will reimburse you for the costs you incur while your home is uninhabitable, such as a hotel room, food and lost rental income. 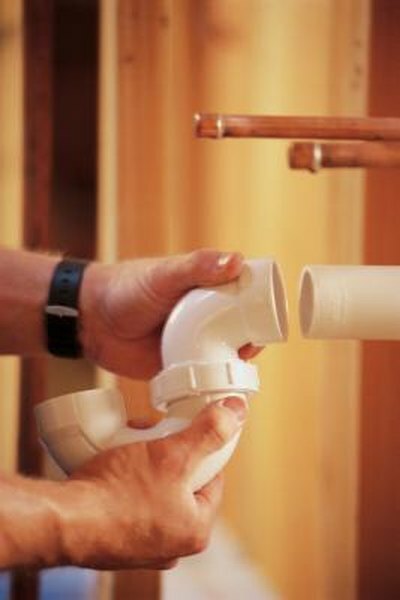 The cost of sewer backup insurance can vary based on the way your plumbing is set up. If you have many pipes that carry solid waste and wastewater away from your home, the cost of your insurance may be more expensive than a home that only has one pipe running out of the home. According to Insure.com, $5,000 to $10,000 of sewer backup coverage typically costs $75 to $150 annually. Sewer backup insurance covers damage to your home's main sewer line, which runs from your home to the city's sewer main. A sewer backup can be caused by the overall deterioration of this pipe after decades of use. The main sewer line can also become damaged by tree roots that invade the pipes as they grow. Sewer backup insurance will cover the cost of repairing or replacing this pipe. The insurance also covers professional cleaning or replacement of furniture or carpeting damaged by the backup. In parts of the country that are prone to flooding, it is important to have both flood insurance and sewer backup insurance. In some new homes, the drainage system for rainwater and sewage runs into the same pipe. During heavy rain, the pipeline can overload and cause a sewer backup in addition to rainwater flooding. It is important to have both forms of insurance to ensure any such damage would be covered.